Brett: I'm Brett Larson. We are at PowerPlex. We're talking with Doug Hockenbrocht from Plante Moran. Tell us a little bit about what your company does. Doug: So we're the 13th largest audit/tax and consulting firm in the U.S., also with international offices. So we provide business advisory and accounting consulting services to clients in multiple industry verticals, with manufacturing being a significant one. And within consulting, we do a number of things from IT strategy to evaluation of technology. We do implementation of technology, such as Plex, and we do security assurance and many other global consulting capabilities for manufacturing companies. Brett: Which is what brings you here today, for PowerPlex. Brett: Because you do Plex implementation. I wanna start with something you just said, because it caught my ear and I've heard it prior, is security. And I know a lot of the companies that are working with Plex, that's one of the reasons they wanna use it because they don't have to worry about all of that. It's just...it's an interface that does its job and the data center and all that, it's not their headache. Doug: Absolutely, that's a great point. 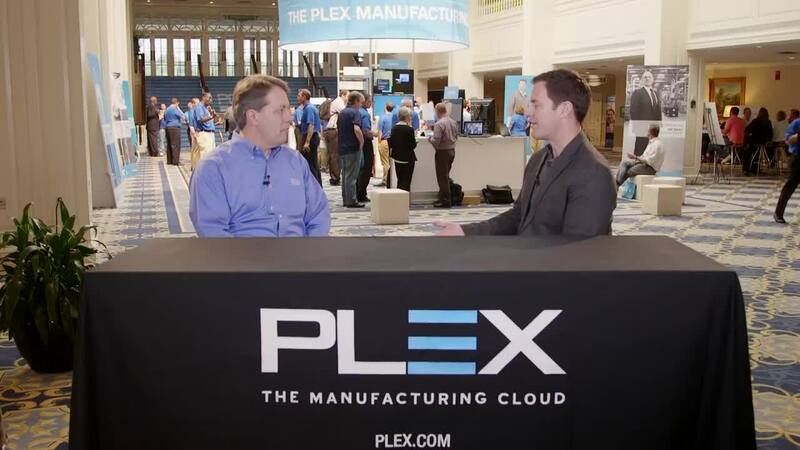 So we've had about a nine-year relationship with Plex, and one of the common themes we'll hear from prospects and customers is the challenge they have, whether they're a mid-market manufacturer or a large manufacturer in terms of maintaining all the IT competencies and skill sets internally on their payroll. So if they can give pieces of that away, data center hosting, cyber security, things of that nature, as you said, it's very attractive for them. It's not very affordable for them to try to provide the same level of service and such that Plex is able to do on their own, where Plex has specialists in those particular areas. Brett: Now, since you help implement you get to literally be on the front line to see the challenges. What are some of the challenges that companies face prior to going to a system like Plex? Doug: Well, typically, data accuracy is always one. Often times when we begin to engage with somebody on Plex implementation we may find that they use one or many systems today. They don't talk to each other, so you have data that is repeated multiple places in the organization, which then means it's not standardized. So a customer is not a customer or a part, maybe called different things across different plants. It also means that if the data's disintegrated, probably the people and some of their activities are disintegrated as well. And so, you know, one of the common themes for why people go to Plex is the integration. So it pulls people and processes together and then it forces them to standardize their data as well. Brett: Right. And so after the implementation, what do you see happens in a lot of these organizations? Doug: So, one, they have better information and they have information that they can begin to trust because there is a single source of that, IE through Plex. Then what happens is you are now presenting better, clearer information to management within the organization, which often they haven't had for years. So that's a good thing. It's also a challenge because now they are seeing things going on in their organization that maybe they weren't aware of previously. So there's a maybe set or series of problems they are faced with, which they're good because now you have visibility, now they have to solve them. So as the technology becomes more integrated and more connectivity, it raises the need for the human beings to be better problem solvers because the information that they use to not be able to get that they would need to solve a problem is now available. So now they have to go to the next tier and actually solve the problem. Brett: Solve the problem, which a lot of companies don't like. They don't like having to do that. From the keynote what was the thing that really stood out to you of the announcements today? Doug: So, I think for Plex, so there's clearly an incredible expansion of the solution that's going on. You know, connecting different types of devices that different people on a manufacturing company could benefit from to connect back to the state of repository within Plex. You know, whether it's Google Glass or better integration to the shop floor, or the sales floors and work day alliances that are there, you know, it's an indications of, you know, Plex deciding what the strategy needs to be for them, what they want to be good at, where they need to complement with some other solutions as they move into different markets. But I think the important thing is them being nimble and flexible enough to recognize some of the new technologies and having a platform where they can be nimble and adaptable enough to bring those things into the Plex community to better serve their customers. Brett: You mentioned the wearables. That seems to be a big talking point today. Is that gonna be... ? Do you think that will be an easy sell to people or do you think people are gonna look at they and go, "Oh, that's... What is this new fangled wearable stuff?" Doug: I think you'll see a bell curve, probably initially within the customer base where you're gonna have some early adopters, you know, and then some others that will wait and see and then maybe some laggers as well as with any technology. I think the common question will always be cost benefit, so we're gonna have some cost for some of this new technology and, you know, and what might be some of the immediate benefits. And again, I think it's all about "How can this technology benefit equip my people, you know, to be better problem solvers?" Because again, it's gonna remove these information barriers that they've had in the past. But, you know, are these people gonna be able to step up and solve the problems now with this technology that's giving them the information, you know, in their environment? You know, if they are counting inventory in the back of a warehouse. You know, they don't have to go somewhere else to get to a computer to look up and see what the system says. They have that information in their own environment. Brett: Right. Another data point that people are gonna be able to get are the machines, the machines are talking and it's not science fiction. They are actually giving really useful information to companies. Doug: You know, that's a huge trend that we've seen. We've had a 9, 10-year relationship with Plex. I would say back in the early days, maybe 20% or so of the Plex customers were interested in integrating Plex with the machines on the shop floor. That percentage has grown over the years in a pretty steep way, particularly as a lot of the machinery that customers have actually has software on it that captures data that can be passed back to Plex, but it's definitely something that is a huge trend and a lot of people are getting an incredible benefit from. Brett: Looking ahead, five years down the road, 10 years down the road, where do you see technology and manufacturing going? Doug: So I think continued integration is certainly gonna happen. So, you know, it might be talking to the machines on the shop floor. There might be wearables technology as we're seeing today. You know, anything that's going to allow a worker who's making a part or in shipping or receiving or the back of a warehouse or in an office environment, you know, better connected to the information they need for their day-to-day job. And I think a lot more of the analytics so we saw this morning with Plex Insight product as an example, where you get to reach into a transaction system like Plex and pull data out that's already being presented in a meaningful metrics-based way, to an executive who's in a certain role. So they don't have to mine data, they don't have to interpret it. It's already what they want, when they want it, and then being able to push that to the device of the day, whether it's, you know, an iPhone today or wearables tomorrow, you know. I'd be honest, I probably don't have the crystal ball 5, 10 years exactly what that next device would be, because we're getting pretty close to having some pretty tight integration with things. I think integration with suppliers and upstream with customers is maybe another horizon that takes higher adoption and a little bit more willingness from people outside of your organization to sign up and participate in that. But that's clearly something that American and global manufacturing needs for, you know, traceability of materials and inventory, particularly as we see a lot in the food industry. Brett: Right. Which would be an excellent application on the supply and demand side. Excellent. So great chatting with you. Thanks you for coming by. Doug: Great. Alrighty, thank you.